In the Summertime is not the first Judy Astley book I've read, but it's the first in a long time. I had filed her away under 'authors whose books belong back in the early 00s; nothing wrong with them as such, but not the type of books that I was necessarily interested in any more. 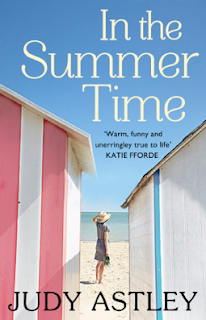 I was pleasantly surprised by In the Summertime, it was a fun and entertaining summer read! It tells the story of Miranda, a divorced, single mother, who returns to Cornwall on holiday for the first time in twenty years. There's a lot of history for her there, and it's the place where her mother has chosen to scatter the ashes of Miranda's stepfather. There are a lot of memories for Miranda in Chapel Creek, not least because whilst there she reconnects with her old friends, Jessica and Andrew, and her long-lost first love, Steve. In the Summertime is actually a sequel to Judy Astley's first novel, Just for the Summer, in which Miranda first falls in love with Steve. I haven't read the original novel, and didn't actually realise that it was a sequel until after I'd finished reading In the Summertime. Because the first book was published so long ago (in 1994), this new book is written in such a way that there is absolutely no need to have read it. There's no sense that you are missing something; Miranda's history is explained in such a way that we come to realise why she was so heartbroken by her holiday romance with Steve, and it becomes clear why she and her old friend Jessica share such a strong bond that they quickly pick up when they see each other again. of speaking, but it's so distracting (and does teenagers everywhere a disservice), when their dialogue is so clichéd. This is an ideal summer read, there is nothing too taxing about the plot, and you never really doubt that it's going anywhere other than where it ends up. The characters are all perfectly likeable, all except for the dreadful Geraldine. However, her appalling behaviour feels like something we can all agree on, the reader and the characters who are affected by it. She's a well written awful character! Then there's Cheryl, another horrible character who you are invited to hate, as she takes against Miranda from the start. However, with Cheryl, she is obviously there as a device to allow Miranda to get her wires crossed about Steve's current relationship status. As the book builds to its conclusion, it becomes painfully obvious how Cheryl's story is going to end, meaning that storyline ends in a predictable way that I didn't enjoy so much. I did enjoy the book though; I liked reading about a central character who has lived through a large part of her life, been married, had children and been divorced, and is now starting on a new phase of her life. It made a change to read about a woman in her late thirties, rather than a heroine in her early twenties, as is so often the case with chick-lit. It was also nice to have a variety of characters to get to know and root for (the teenagers and Cheryl notwithstanding). Each character was going through their own crisis of sorts, and although the story was primarily about Miranda, we were invited along on the journey of them all. I would recommend this to anyone who is looking for a beach read this summer, and if you are a fan of Judy Astley then it's definitely for you! In the Summertime is pubished by Transworld Publishers and is released on 4th July 2013. *I received an eBook preview copy of In the Summertime from NetGalley as an advanced reading copy. This review has also appeared on Goodreads.